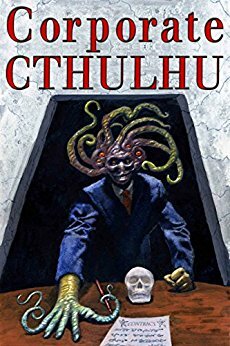 Every week or so I browse through the latest genre releases for the Kindle, in an attempt to really try and stretch the value of my Kindle Unlimited subscription, and as I scrolled through the latest titles for the Cthulhu/Lovecraft Mythos, I was intrigued to see a new anthology appear called Corporate Cthulhu. Published by Pickman’s Press (who appear to be new to publishing Mythos fiction, this being their first title) and funded by a Kickstarter that I’m kicking myself for missing out on joining, my interest was stoked by the title and also the anthology’s cover art. I’ve gone on at length in other book reviews on this blog about the importance of a title’s cover grabbing the reader’s attention, and the cover for Corporate Cthulhu did the job admirably, a very professional piece depicting a Cthulhuoid-looking creature in a business suit. Between the cover art, the Table of Contents and the back cover blurb (“YOUR CALL TO CTHULHU IS IMPORTANT TO US. PLEASE HOLD”) I was sold, and decided to purchase the anthology outright; and I’m glad I did, because I devoured it over the course of two nights in one of the fastest and most intense reading sessions I’ve had in a long time. While it may only be the end of January, this has already shaped up to be my Anthology of the Year! Corporate Cthulhu has a total of 25 stories, which is impressive particularly for the first title from a new publisher, and while many anthologies have ups and downs, or rather some stories that just don’t grab me, I have to say that I enjoyed every single one in this particular collection. Each tale is focused around the same overarching theme – the intersection between the world of spreadsheets, corporate takeovers and layoffs, and the world of Cthulhu, Shoggoths and multi-angular terror – and as with any anthology, I particularly enjoyed a handful of stories. As someone who actually works in a hospital, and in a governance capacity that often deals with vast reams of paperwork, I was instantly drawn to Shadow Charts by Marcus Johnston, one of the first stories in the anthology. The protagonist of the tale, a financial analyst/investigator, travels to a mysterious private hospital to investigate alleged financial corruption, only to be foxed at every turn by perfect records, blank-faced staff and disappearing patients. He eventually uncovers the terrible truth behind the hospital – there is always A Terrible Truth A Price To Be Paid in any Mythos tale – in an intriguing ending which didn’t quite play out as I expected. Casual Friday by Todd H.C. Fisher is a light and enjoyable tale of the world of corporate interns and the short-lived nature of their employment, which I could sympathise with given my own time as a temp; and Career Zombie, by John Taloni, is a well thought-out and often quite touching tale that examines the concept of being a permanent employee, and how some employers could take that quite literally with the right technology. Esoteric Insurance, Inc,by Evan Dicken & Adrian Ludens is a fantastic story, and one of the best in the entire anthology; how could I not love a story that starts with the protagonist, a lowly insurance agent, regretfully informing a property owner that damage caused by interdimensional Mythos critters isn’t covered by his insurance, and ends with a twist only possible through the proper knowledge and application of corporate HR regulations? It is to be hoped that the authors expand on this tale – either through more short stories, or hopefully a full novel. There are certainly some stories in Corporate Cthulhu that aren’t as light-hearted or even humorous as some of the ones I’ve highlighted above. Boedromion Noumenia by Andrew Scott shows the dire consequences of tech moguls trying to acquire prestige that mere money cannot, by delving into glyphs and artifacts that should remain undisturbed, and Incorporation by Max D. Stanton deftly twists the worlds of corporate money and world-ending apocalypse together to show that capitalists and cultists can easily find common ground in the desire for money and power. Forced Labor, by Mythos veteran Peter Rawlik, is a slow-burning and thoughtful story that questions the nature of slavery and indentured service and makes uncomfortable, although essential, reading. However, by far my favourite of all of the stories in the anthology is Dagon-Tec by Adam Millard. It is a short story, perhaps one of the shortest in the collection, and yet I cannot remember laughing so much, or so hard, when reading any other Mythos tale. The plot of Dagon-Tec is almost irrelevant, because within these pages Millard manages to effortlessly lampoon almost every single trope of the Cthulhu Mythos, even going back to Lovecraft himself. From the protagonist writing his story on the back of a cereal box “as I could not for the life of me find a piece of blank paper”, to every character coincidentally having a forename and surname lifted from Lovecraft’s works, and an extended argument around the use and context of the term ‘gibbous’, the author expertly dissects the Mythos genre and the lazy clichés and coincidences that often infest its writing. The anthology is entirely worth the price for this story alone, and if Mr Millard can keep up this level of quality I would expect him to go far in the genre. In conclusion, Corporate Cthulhu is a brilliant anthology and a huge success for Pickman’s Press, full of high-quality, well-written tales from both new and veteran writersof the Cthulhu Mythos. As of writing it is a mere £2.99 for an eBook copy, which is frankly a steal, and should be picked up by anyone interested in either good Mythos fiction, or just good writing overall.